This sweet look between an aunt and her niece has been making our hearts soar. Today, we'd like to tell you their story. When they arrived at the recovery center, Judeline had been caring for her newborn niece, Joalyne, for just 21 days. Joalyne's mother had died just 6 days after her birth, likely due to complications from an unassisted delivery. 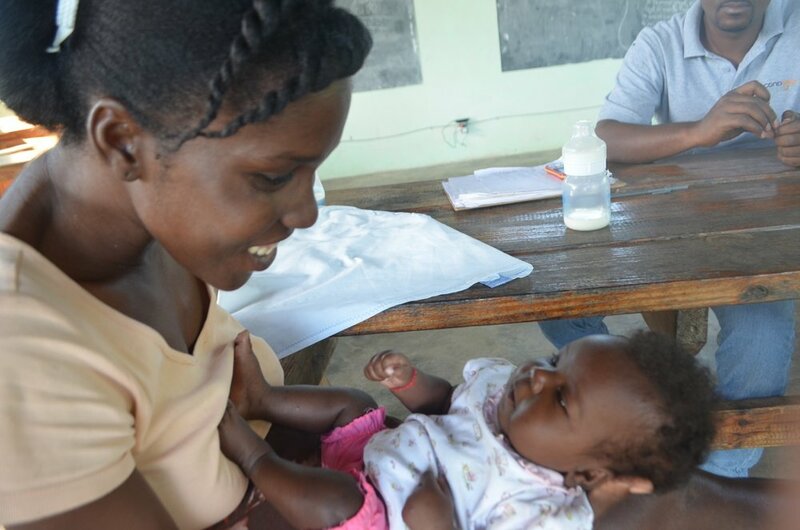 Without access to breastmilk, Judeline had no choice but to feed the baby from the foods that were available to her. Judeline was an experienced mother; she had already given birth to three healthy boys herself. However, this situation was a new one. She knew that the pharmacies in the city sold special milk for newborn babies, but when she asked someone about the price, she realized that a single can cost more money than she had to feed her entire family of five for a week. She simply did not have the money to purchase expensive formula. Instead, she did her best, making plaintain porridge and splurging on cans of Gerber baby food when she could. Inevitably, these foods were too harsh for a baby not yet a month old and they weren't providing enough nutrition. Rather than gaining weight like healthy babies should, Joalyne was loosing it. A friend and former graduate of Second Mile Haiti, Yglie Pierre, began to take note. She knew the signs of malnutrition and she knew that babies who did not breastfeed were at risk. She also knew that feeding a newborn solid foods too early could lead to malnutrition. She had unknowingly made the same mistake with her own daughter. Her own experience with malnutrition had left Yglie acutely aware that if things didn't change, her friend's newborn niece would not have much longer on this earth. She told Judeline about the recovery center, where she knew that education and infant formula would be available to help. When they arrived at the center, the baby had been without adequate nutrition for 27 days. She weighed 5.2 lbs. Though she was 7 months pregnant herself, Judeline agreed to participate in the recovery program. They stayed Monday through Friday until Joalyne made a full and complete recovery. She gained 4.7 lbs. Judeline became the caretaker of her infant niece the moment her sister succumbed to complications of childbirth. Her bond with Joalyne began during those first 21 days while she was doing everything in her power to keep the new baby alive. But when she got to Second Mile Haiti 'everything in her power' changed drastically. And so did her relationship with her niece. Each day that Judeline watched Joalyne grow and respond to her loving care, their bond grew deeper. Their bond grew the more she was able to relax into her new knowledge about how to care for a baby that didn't have access to her mother's milk. December 8, 2017 - Judeline shows off her health education post test. A perfect score. Their bond grew again when she was able to take her niece to the local hospital's Pediatric clinic where her fears about the baby's health were put at ease. And their bond grew even more, each and every time Judeline responded to Joalyne's cries, smiles, and new motor developments, made possible now that Joalyne was receiving adequate nutrition. Haiti has a unthinkable number of children growing up in orphanages. More than 30,000 children don't live with their families. This happens when families like Joalyne's don't get the support they need to care for these vulnerable children at home. 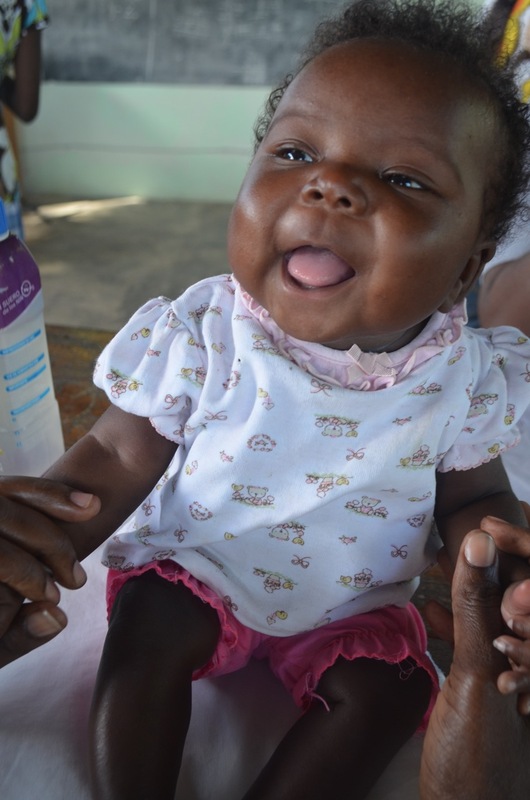 Haiti also has one of the highest infant mortality rates in the world. More babies die during the first month of life in Haiti than anywhere else in the Western Hemisphere. So high, in fact, 1 in 40 children won't live beyond the first 30 days of life. Joalyne arrived at Second Mile at day 27. Because of the many individuals who support our work we were able to provide all the infant formula and medical care she needed to recover. 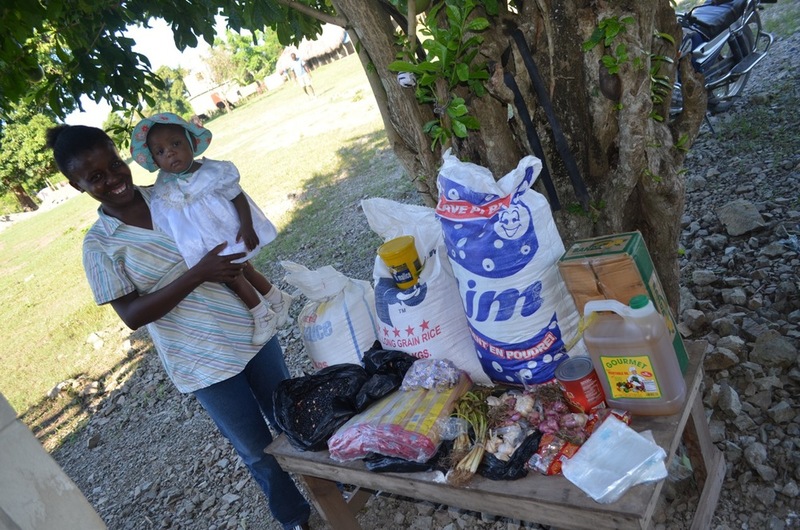 We are also able to help Judeline's family with a business kit that will increase the family's income and help them cover the additional costs associated with caring for the newborn. And though Judeline will give birth in just a few weeks, her husband, mother, and 13 year old daughter are ready and able to help both with the new baby and the business. It won't be easy, but this resilient family is determined to make it work. Our support will follow. This Holiday Season and we want nothing more than to be able to do the same for each new family that finds their way to our center. To do so, we need to see our online Holiday Catalog funded in full. Each year, during the busy season of parties and presents, traditions and traffic, we post about the impact of your contributions to Haiti and ask you to consider making a year-end gift to support our work. 19 gifts categories remain with gifts like Literacy Kits ($25), Infant Formula ($75), and Business Kits ($250). This week, we're looking for 100 new gifts. Every gift, no mater how big or small, makes a difference for families like this one. A few days ago while putting together a status for our Facebook page, I found myself captivated by one family in particular. To learn more about them, I took a terse spin through our electronic database, chasing the answer to one question after another and marking my journey with mental bullets. It was all VERY interesting. For the next 24 hours, those mental post-its persisted to flash in my brain like internet pop-ups, beckoning to be made into a story that could be shared. To buy time, I wrote them down with a pen, in a notebook. And now here I am, not two day later, engaging in the most permanent form of note-taking: blogging. What do you do when you’re at capacity? This morning I received an email while at home. "Peterson was discharged from the hospital and is now back at the facility. We have 13 moms and 16 kids. We’re out of beds." Our facility is set up to accommodate 12 caregivers with their children, meaning there are 12 beds. The last couple weeks we have been completely full. In addition to taking in 13 caregivers and their 16 kids in treatment, there are also an additional five healthy siblings staying with us as well. That makes 13 moms and 21 kids for 12 beds. It's a full house: to say the least. I called back a little panicked. Kerline (our health educator) answered the phone and said, "no problem, we have a solution." Verdieu, our groundskeeper, who lives on site, gave up his bed to Peterson's mom. Plus, another Mother with only one child said they would take in another child to sleep in her bed. These are the moments that tug at my heartstrings. These children and their caregivers were complete strangers before coming to our site, and a week later they are offering up their beds to accommodate another in need. We have always strived for our treatment center to have a family-like atmosphere, and I think this is what it looks like. The good news is that this will soon be a problem of the past. We just started our project with the United Nation. Through their support, we will double our capacity. That means an additional 6 rooms, 12 beds, a health education building, a recovery wing and a sustainability workshop. The site is buzzing with workers, supplies and plans coming to life. I can't tell you how much I love construction. I look around and see potential everywhere, and think about how great it will be to have the capacity to have 12 more moms staying at our facility. But the most exciting part of doing construction in Haiti is seeing the 30-40 new faces in the facility everyday, thrilled about the opportunity to work. That’s 30-40 more families we’re able to directly impact. They say that Haiti has an economic multiplier of six. That means for every one job created, six more follow. And we can see it happening right before our eyes. Ladies come in from the village to sell food and beverages to all the workers. Motos are transporting people back and forth from the job site. All while the 200 sacs of cement, two tons of rebar, multiple sizes of wood, and mounds and mounds of gravel and sand are purchased from local business and establishments in Haiti. Everything feels, exciting, full of potential and most importantly: hopeful. At the beginning of the day I was trying to figure out how we can make room for one more, and by the afternoon all I can wonder is how big we can get. Amy and I are beyond thrilled, about everything happening at Second Mile, but while were in this period of transition, we’re also running at capacity. Here are the top four things that could give you chance to get involved in this exciting time, and help take a little stress off of us. 1) Pray. Pray. Pray. We love more than anything when people are praying for our mommas, kiddos, employees, future projects, and just overall high spirits. 2) Hospital Bills. These past couple weeks we have taken on some pretty difficult cases. We didn't even think twice about these cases because we knew no matter what we would figure out how to provide for these conditions: hydracelphus, cerebral palsy, club foot/abnormities, and a heart condition. These are special cases that need extra attention along with extra funding. They all need to see specialists and God willing they will all get surgeries. In our Holiday Catalog last year we asked for $1000 of funding for our critical cases. Since January 1st we have already spent $450. We predict this year we will need additional $1500 to cover all the needed hospital visits. 3) Community Help. Our local community has decided to build a church. We love Pastor Mark and would love to support his building efforts. 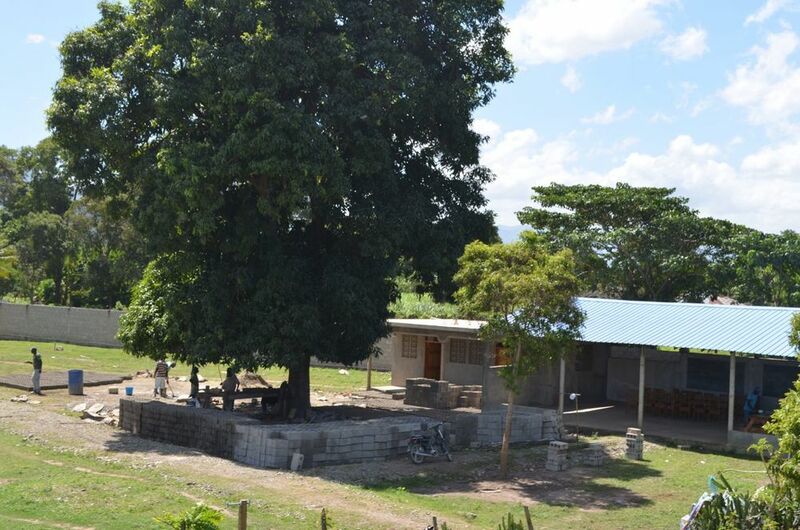 We have already donated the supplies and materials to lay the groundwork of the church, but we need an additional $1900 to add to his Phase 1 of construction of the Jean Louis Church. All of our employees attend this church and in addition to over 300 people living in the village, so this something we would really like to offer to the surrounding community. 4) Building Projects. Although the two buildings are covered by the UN grant we have made some modifications the past month. We have added an additional health wing / pharmacy to the mix. This will help us support the various health needs of our children when were operating a larger capacity. We are hoping to have a combined effort of $6500 raised towards this new building. We’re also constructing a sustainably workshop where we will produce yogurt, cheese, jam and bread to be sold local markets. Those profits will help strengthen our programs and increase our sustainability in Haiti. We are fans of both methods ;) (Please designate where you would like your contributions to go). Thank you for again giving us the chance to lay it all out there. This is the picture that's making me all happy-feely inside. There's just something about it. Maybe it's the mom's smile. Maybe it's the sparkle in her eye. Maybe it's the way she holds her baby, cheek to cheek, or the obvious pride she takes in dressing him to the nines. Maybe it's the way she's standing, all 17 years of her, erect with confidence. This image drips with hope and promise. The economic kit that rests at her feet represents an unlimited number of opportunities. With it she will eat. Pay rent. Help her family. Put money in the offering basket. Take her baby to the hospital when he's sick. Take herself to the hospital when she's sick. Heck, she might even buy herself a brand-new pair of third-hand shoes when her plastic sandals refuse to be repaired, not even one final time. In a few years she'll send this baby to school. She'll be lauded as a smart and successful young person. She'll make good choices. She'll rise up from the flood-waters. She'll remind us that there is hope. How can I be so sure? How can I sit here and tell you that 50 lbs of rice, a few gallons of oil, and some dried up fish will really take her to such hopeful places? Because she came to the center every Monday and stayed Tuesday, and Wednesday, and Thursday and Friday for 9 weeks!!! She wanted this opportunity and worked hard for it. Nothing was more important to her than getting that sick baby healthy. It was obvious in the way she recorded every ounce of infant formula he drank and the way she cared about every gram of weight he gained. It was present in the way she dutifully checked his [cloth] diaper for signs of diarrhea, and the chipper way she sprang for the wash basin every time he soiled his clothes. For me, the tell-tale sign was how she carried her kid. She had mom-swagger. Her 4 month old baby was sick because she had been ill-advised to stop breastfeeding and without mother's milk she didn't have the resources to keep him healthy. But at Second Mile, with some guidance and the right resources available to her, she was killing it. The way she carried her things to and from classes, a notebook and pen in one hand, the baby tucked into the crook of her arm, a spare blanket dangling from who knows where, and the baby's bottle with an ill-fitting couviture expertly balanced in the grip of hand #2. The way she masterfully utilized all 10 fingers and an elbow-armpit for crying out loud the way normal people (people who aren't moms) use only their two hands, told me this: she will be just fine. No, she'll be better than fine. But even more compelling than mom-swagger is the fact that more than 40 other women have stood in that same spot, posed for a photo under that same tree, and then went home to "take care of business" with a new sense of "can do" and candor. I'm so proud of the staff because they have to be doing a million things right for us to be able to see this much success with a program that could just of easily turned a million shades of wrong. But it's working. Follow-up visit after follow-up visit we see that children are getting better and better and with each passing month families are becoming stronger and more self-sufficient. I had the great privilege of spending a few hours at the center, yesterday. I had to pick up some boxes of Medika Mamba and bring them out to the site. Normally Jenn handles that, but she's in the States, fundraising. During this season of fundraising, and goal-setting, and end-of-the-year reporting, I typically work from my "home office" more often than not. The land has too many tempting distractions. I'm simply not strong enough to work at a computer when I could be having conversations with the world's greatest moms, or watching our amazing staff work (which is mesmerizing, by the way), or playing with babies of the goat, canine, and human varieties. Basically, if I hope to get anything done I steer clear of the snare and work from the silent haven that is my kitchen. Except that yesterday I didn't. I made the 25 minute drive out to the site and these are a few of the things I witnessed while I was there. I was trying to get my computer unfrozen so that I could share some information with our health workers. I was sitting in the clinic where two moms were waiting. Both women are program graduates and their time at the center had overlapped briefly. "I asked about you" said one mom to the other. "They told me you were at Milot (a hospital)." "No" the mom replied. "I was at Limbe (a different hospital). We were there for 11 days." She shakes her head and looks down at her daughter who has been doing well since the hospitalization. "She had to be on serum (IV fluids). Every time they put in an IV, she ripped it out...(pause)... I cried" she confesses, still shaking her head. "It was good for her" the other mom piped in reassuringly. "She needed it. The serum did what it was supposed to do." Although they were discussing a difficult experience, it was a beautiful moment. I was struck by the fact that two women who live nearly four hours apart (one lives two hours from the center in one direction while the other lives nearly two hours away in the opposite direction), could share this moment of vulnerability and compassion. I was shocked to hear a mom speak so freely about her child being in the hospital for 11 days. Sometimes I sense shame. It's easy for a mother to feel like she's failed her child if she ends up in the hospital. But these moms have a good sense of self. They know they're doing a great job as moms. They know that illness happens and that sometimes it's preventable and sometimes it's not, but that it's never their fault. And I think they know that these sisters, the ones they met through this program, understand that better than anyone else. These friendships are built on the shared experience of crisis and triumph. While the women were talking, Fara sat happily on the floor, playing like the professional player she's become. But then her mom decided to step out. As soon as she left, happy Fara started to wail. Neither I nor the other mom could console her. So we waited. The look on Fara's face when her mom reappeared was priceless. She started rocking her body, flapping her arms, and making what I can only describe as a the cutest smiling noise I have ever heard. I'm not a mom, so the closest thing I can imagine is how excited my dog is to see me after I've been gone for a few hours. This child was ecstatic and her mom had been gone for less than a minute. I couldn't possibly imagine these two, one without the other. Fara is well-attached, well-loved, and a source of joy to her mother. "Who is that kid?" I asked Kerline as I tried to focus my gaze across that courtyard on the profile of a child I didn't recognize. I could make out the woman feeding the child. I knew her name was Cherline, but she was someone else's caregiver. Then another mom walks over and I realize who the baby is. Daniel has been coming to Second Mile with his mother every day for the past several weeks. He and his mom were program graduates back in March, but a few months ago her house was burglarized, her business stolen. We decided to employ her for a little while so that she could get back on her feet after the break-in. While she works, the other moms look out for Daniel. They feed him, play with him, and they call for her if he needs anything. I watched Cherline scrape the last of some rice out of the bowl and give Daniel one final spoonful. Then his mom picked him up and the two women smiled at each other. One went off to wash dishes, the other went off to wash her baby boy. Did that really just happen? Yes, yes it did. Women happy to see one another succeed. I was sitting with the cooks under the palm frond canopy that covers their space. We were talking about green charcoal and all the veritable ways Haiti has been moving forward in the last several months. There was a mom close by washing the pots from the afternoon meal. In my mind I pictured the freshly painted buildings I had passed earlier in the day, the solar powered street lamps newly installed in a highly populated but not-so-safe area of town, and the brand-new international airport just a few miles from where we were having this conversation. They spoke of education, aid, government, and NGOs. The underlying message was "now we know!" Jiji had an explanation. "Before people were just having a lot of kids and there wasn't a strong regard for education. But now people value education, they value family planning, they know how to do more. They know how to use the land better. They know that cutting down trees is bad." She made it seem so simple. Everyone deserves to learn right? Knowledge IS empowering. Children are learning these things in schools. Adults are attending meetings in their communities. There are radio messages and announcements in church... Information is spreading and the entire country will be the better for it. It was an energizing conversation that got better because of what she Jiji did next. Guillouse was leaving with her 2nd commerce package. The second commerce package is $100 of product that each program graduate is eligible to receive 2 1/2 months after she leaves Second Mile. It's an incentive based system that places value on the first business package by making the second disbursement dependent on the success of the first. For an opportunity to grow their business, the moms must be judicious with what they've been given, they must show that their business is growing because of the work they put into it, they must attend follow-up visits at the center and their baby must be meeting certain health markers. I watched Guillouse walk over to the gate and open it so Herode, who would take her home, could drive through. The moto was piled high with her stuff. Just as she was about to draw the gate closed Jiji called out to her. "I'm happy for you. Your life is changing." Guillouse smiled and nodded. "Andy!" everyone said in unison when a recent program participant came through the gate with her grandson in toe. They were here for a follow-up visit. "Andy's been sick," the grandmother announced before greeting everyone in the room. Several mothers were sitting in the clinic and she knew most of them. "What did he have" I asked. "Diarrhea and vomiting" she replied. "I've been at the hospital with him. It was so bad I though he had cholera. They even put us in the cholera treatment unit." "Two nights," she answered. "The pregnant mom, with the boy... What was her name? She was there too. The boy had cholera." As she finishes her account of the Hospital, she opens her bag and takes out a plastic thermos of clear liquid presumably ORS. (oral rehydration solution), that she had prepared before leaving their home. She gives Andy a drink and the moms start to talk about something else. This was all I needed to see. She came with ORS which means that a) she knew that it was important, b) she knew how to make it and c) she had clean water and something to store it in for the trip. At this point I wasn't worried about Andy. I wasn't even worried about "the boy" (whom we determined to be another program graduate's younger brother). I was simply proud. This is exactly what is supposed to happen. Parents, and in this case, grandparents, are supposed to have the resources they need to get the help they need. Andy's grandmother and the mom she encountered at the hospital knew where to access healthcare, they knew when to access healthcare, and they could afford to access healthcare. Isn’t it incredible that for less than $500 per pair, we can meet the physical needs of a child while supporting the child's guardian with food, a safe place to re-nourish, and assistance with medical care. And as things take a turn for the better, we're able to offer empowering education and supportive community, both of which help the caregivers feel confident in their ability to care for their child whether sick or healthy. The gardening classes inspire the moms and get their creative juices flowing. At the center/farm they get to participate in the growth-cycle of food and can take the skills (and the seeds) home with them. The business classes that caregivers attend give them a real-life chance to change their situation and remove some of the factors that contributed to malnutrition in the first place, namely the lack of income-generating activity. Then we get to see them doing their mom-thing. They come for follow-up visits with food. This is such a big deal! I can feel my ability to articulate flying out the window as a type this…I can feel something water-like in my eyes. It’s such a big deal. Mothers in desperate situations don’t have diaper bags. They don’t bring juice and snacks when they leave the house with their kids because they don’t have those things. But these moms do. It’s working. Sanchez and his mom 2 months after Leaving second Mile... 1 month after starting a business. Remember this kiddo? Maybe you don't. If you are new to our story you won't recognize these people. This is Jenn and I with Claire and her daughter, Marie Ange. This was our first mom on her first day. This was the beginning. We all got incredibly close to these two individuals. Their names have come up over and over again in our blogs. Marie Ange was 18 months when she and Claire came to stay at the center. She weighed just around 8 lbs at the time. A few weeks before this photo was taken she had been admitted to Children of the Promise (an inpatient care center for infants). They began caring for her when her life was on the line but when our doors were open they sent baby and mom our way. We're so thankful that she survived and that she responded to medication, therapeutic food, and the love and affection of her mom. She's a miracle, the first of many that we've been able to witness since then. This picture was taken a few weeks ago. Marie Ange is now 3 years old and she has a baby sister. We may take a ton of photos at Second Mile to document a mom's journey through the program but this here is the most important photo. This is the one that really matters. This 18 months later- at home- eating something yummy- sitting next to her sister photo. This is what we work for. Want to be a part of these stories? Check out our Holiday Catalog. It's time to write a blog post about time. I'll be honest. I don't really want to be "blogging" right now. It feels a bit obligatory. It also feels a bit like forcing happy when in actuality I'm feeling far from it. My better half/partner in crime is far away in America and going through a hard time. Jenn left Haiti on the 13th. Her grandmother passed away 3 days later at far too young an age and far too soon after Jenn and her siblings had to face the death of their father (in March). Today is the memorial service for 'Mimi' and Jenn is giving the eulogy. I wish I could be there. I could have joined the family for the services, of course. But I simply didn't get up and go. Leaving Haiti tends to be more difficult than staying. Still despite the rainy, dreary week (and the broken vehicle, and a new baby with a heart condition, and a new baby with TB, and sickness, and death, and the events happening in Texas, and the wrath of Chickengunya that seems to be ravaging Port-au-prince and creeping it's way up the central coast to the North) I really must blog. The tricky thing about time is, it's fleeting. If you don't take advantage of a moment, it's gone. So in this moment I'd like to recognize that it has been 1 year since Second Mile Haiti opened its proverbial (and literal) doors. That's right! On May 15th, 2013 a 31-year-old mother of two arrived at our facility with her 9-lb 19-month-old baby girl. Those first few nights she was the only momma at the facility until, a few days later, we got a call about another mother and child. This mom had 5 children but it was her youngest, and only daughter, who was struggling with malnutrition. Moms Claire and Rosna with daughters Marie-Ange (then 19-months) and Witchana (then 15 months). May 2013 (one year ago) Claire sits by Rosna in the Education Center to support her on her "going home, graduation day"
These two moms laid the foundation. They showed us what it would look like to partner with moms. They were genuine, receptive, patient, and kind; wise, resilient, and strong. With their children they were self-less, nurturing, and affectionate. We loved them (and still love them) a lot. We are grateful that they shared there lives with us for a little bit. Claire and Rosna are seriously good people. Claire offering Marie Ange some yummy mamba! Rosna with Witchana at home, a few months after their short 15-day stay at Second Mile Haiti. The two women had a lot in common and became fast friends. They live in two different towns at least 30 minutes apart. But we know they call each other on the phone to check in and sometimes they'll show up for a visit to Second Mile on the same day. That's what happened last week. Both Claire and Rosna came with their girls on the same day! The moms were happy to see each other and I think Witchana would have been eager to play with Marie-Ange...but not so much the other way around. When we tried to get a picture of the two girls sitting together MA was not having it! It would have been the ultimate then and now shot, something like recreating an old family photo. But Marie Ange is so attached to her momma that no one was going to be able to get her to sit by herself (although Witchana did make a valiant attempt to hold her friend still). I shouldn't have deleted those photos. They were hilarious. But unfortunately, I did. While we didn't get to recreate that photo from last May what we do have is a few photos that will show just how well these girls are doing now, 12 months after they first spent time at Second Mile. Marie Ange at 19 months and 31 months. Witchana at 15 months and 27 months. I know that today is actually May 22nd (actually it's now the 25th!) And here we are a week after our 1 year anniversary. But I think this is one of those better-late-than-never posts. Witchana looks great! (So does Marie Ange). And these moms are happy. So maybe Second Mile did make just an teensy-weensy bit of difference for these families. Maybe it was the nutritional nudge. Witchana gained 1.5 lbs in her 10 days at Second Mile. And Marie Ange made the most progress during her second stay at Second Mile where she gained 5.5 lbs in 7 weeks. Or maybe it was the follow-up, the education, or the business (i.e. income). It was probably the business.. or a combination of things. And just to be fair, these mothers unlike many of the others are fortunate to have access to healthcare services that are about 80% free to them. This means that both girls can get care when they are sick. That's a huge factor in their staying healthy and we need to recognize this particular hospital and the Haitian Ministry of Health for making those services available to them). Still, I think it's fair to say that both of these girls were in pretty bad shape initially (especially MA). The rehabilitation they received at Second Mile was, in fact, a good and necessary intervention. The thing about malnutrition is that it causes you to be more susceptible (in a weakened immune state) to other infections. And the thing about other infections is that they can cause or worsen malnutrition. Sick kids sometimes just aren't very hungry or don't want to eat. And even when they do eat, the calories they consume are directed towards fighting the infection rather than weight gain and growth. It's clearly not ideal to stay in a malnourished state for any length of time. 40% of childhood deaths, world-wide, are of dual-cause: infection in the presence of malnutrition. That's kind of why it's such a big deal to be able to help families get medical care. Not all infections are easy to treat. Treatment for TB, for example, is a long and cumbersome undertaking for both families and health-care providers. The WHO believes that 74,000 children die from TB each year (WHO Global TB Report 2013). Severely malnourished children and children with HIV are the most susceptible to TB and the most likely to die because of it. And TB is just one example. There are plenty of yucky illnesses and infections ready to prey on the vulnerable. So, the getting healthy was important. But the moral of this story is the staying healthy. And our conclusion is that moms can. They absolutely can. These pictures in this post weren't before and after pictures showing the progress made when both mother and child were at Second Mile. These were taken a year later... The girls stayed healthy with their mothers and aunts and grandmas and uncles...at home... despite all of life's challenges and expenses. So hat's off to you, mommas. And Happy Haitian Mother's Day! Well hello there. How are you? It feels like we haven't posted in a long time! I hope you got our newsletter in your email. If you didn't you can sign up for our e-newsletter on the website or view it here. So much has been happening here in Haiti, it's hard to know where to begin! Most days are either really hard or really exciting. Every day is full. Those of you who have been following since the beginning have seen Second Mile grow from the ground up. You heard from us during our first 3 months when we were sharing our vision in the States and stuck with us during the next four months of getting our bearings in Haiti. You watched us (and helped us) buy land and spend a full year building the facility, pushing ahead with construction only so long as we had the funds. Then on Mother's Day 2013 we opened our doors and started to walk alongside our first mother. Can you believe it? On Mother's Day 2014 we will have been functioning for one year! Wow! It sure feels like it's been longer than a year. We still follow-up with the very first moms. Their children are doing very well and many are still doing well with their micro-businesses. Those that aren't, are still making it work somehow. Their not-so-successful business ventures have helped our business program director come up with better ways to get moms on their feet and to help them succeed even though the odds aren't stacked in their favor. All the moms that stuck through the recovery program are still bringing in healthy children for follow-up visits. Not including the three cases I just mentioned, we've worked with 26 mothers and have nutritionally rehabilitated 30 children. And guess what! We are still passionate about empowering women. And we still believe in caring for mothers of malnourished babies in this unique way. We are still doing the same ol' things but it looks a lot different with so many more women in the mix! Our process is still to come alongside women during their child's health crisis, offering a place of recovery, nurturing that mother-child bond, and offering educational and skills training opportunities through which women can begin to bring themselves further away from that scary place where their kids are experiencing undernutrition, hunger, and illness. I've spent a lot of time with our photos lately. We have got to get our act together and share some of the amazing images with you. I hate to admit it, but we don't even have a single page on our website that shows what we actually do, now, present-tense. The pages on our website that describe our facility were written when Second Mile was just a dream of an idea. That's got to change! Until it does, this small photo collection will have to serve as an update. We've chosen the photos that reveal moments of hope, courage, and joy. As you linger on these photos and read their captions I hope you will consider what improved health, empowerment through education, and new economic opportunities can do for women in Haiti. Baby Daniel had his first follow-up visit. Way to go mom! He continued to gain weight during his first week back at home. We've added a new activity into the mix: Infant Massage. The practice of massage has many benefits for babies. It helps their digestion, immune system, and mental health. The class is taught by our very own Ms. Kerline. Ms. Kerline recently took a 40-hour Infant Massage course and is now a certified Instructor. Moms use infant massage to connect with their babies and have . The beauty of putting a bunch of women together is that there's always the potential for one to support another. My favorite thing (in the world!) is watching a group of expert, seasoned moms teach a new moms the ropes. Moms gather around a new mom who will spend her first night at Second Mile. Natalie and mom share a moment. No one else can make her smile that big! Kerline works with a new mom while two babies play in the background. Their moms are over in the education building sitting in on one of their final business classes before they "graduate" and leave Second Mile at the end of the week. Friday: The moms wait to get the last weight of the week. Edlin lost all of his edema in the first 10 days. He is now eating Medika Mamba. As we expected, all moms have been hugely invested in their child's progress. Many of the moms remember their child's weight from day to day. When a child doesn't gain weight and it's not because of infection or complication, the moms are empowered to think critically. Is it the timing of feeds? The amount offered? The feeding method? They begin the day ready to troubleshoot. The nurses stand by to help and guide. 8 month old Judeline (8.5 lbs during week 2 at Second Mile). Around 8 am each morning, the moms mosey into the clinic gallery and chat with one another while Ms. Prestina (nurse) weighs the children one by one and takes their measurements. For most of the children the goal is to gain weight. But for the children that come to us with swollen limbs [a sign of acute malnutrition], weight loss is actually an indicator that the child is making good progress. The child below is a good example. He was admitted with swollen limbs and face. We began by teaching the mother how to make [and administer] a special stabilization formula of therapeutic milk. The formula is made using sugar, oil, milk, water, and cereal flour in amounts set to offer precisely the right nutrients and calories to stabilize him without any adverse effects. At first the milk was given in small volumes (according to his weight) every 2 hours, then he graduated to every 3 hours, and eventually every 4 hours. His mother was the one giving him each milk feed. Her happiness, and his, is truly a byproduct of much patience and perseverance. 1 year old Esther making great progress. Walking back from a morning business course. The facility is set up so that moms can always be close by their kids whether that means taking them to classes or letting them sleep with another mom nearby. This helps the kids gets meds and feedings right when they need them no matter what else is going on. Above, a mom takes her health education post-test. Her daughter is well and she's about to leave our program so she answers questions about the topics that were covered during her stay. She describes specific concepts related to maternal health, nutrition, and disease prevention and proves that she's heading back to her community with a lot to share. In the photo below, a mom requests that photos be taken to commemorate her daughters 1st birthday. Speaking of birthdays, $3,800 was raised during our recent Birthday Fundraiser. A sincere thank you to those who donated. An older brother follows mom to "school." The goats are brought in for the evening. The family bond stays strong. A quiet 18 month old sits in the clinic with her aunt. They get some quiet time away from the other moms and babies while she finishes a sachet of Medika Mamba. This last photo is what it's all about -- How can you empower a mother to care for her vulnerable child if that child is in an orphanage? How does she learn to apply life-saving behaviors (like giving oral rehydration fluids when her child has diarrhea), if mom and baby aren't together? This mom is 18. The mom next to her is 18. And the mom next to her is 19. It's just a coincidence that the young mothers sat together in the back row and all the women in the front are much older. Or maybe they just have better vision...? The point is that the young mothers aren't done learning. The older mothers aren't either. I can't quite get what's happening in this photo into words, but it's good and it's powerful. A mom sits in literacy class with her baby and a pitcher of oral rehydration fluid which she made earlier in the morning when the baby first began to have diarrhea. Next to her notebook is a piece of paper where she is keeping track of how much the baby drinks. All the moms at Second Mile learn how to make oral rehydration solution and the importance of giving fluids when your child is sick. They get hands on practice if their child has episodes while they are at the facility. Worldwide, diarrhea is responsible for more childhood deaths than any other cause. On Tuesday, after spending seven weeks at Second Mile, Daniel and Miselene went home! This post is about what his transformation looked like, how it happened, and well mostly what it was like to provide a mom with a few basic tools and watch how she used them to care for her kiddo. to simply because she was so great to have around. much and the others needed to share the load. She was eager and smart. Pleasant. Kind. Sweet and respectful. And there wasn’t the slightest bit of doubt that she cared about the well-being of both of her children. This must be true of all mothers- deep down- it’s just that not all moms manifest their concern in the same ways. Some moms are simply so beat down that the emotions and reactions you would expect to see aren’t the ones that surface. That’s probably why I enjoyed Miselene so much. Her emotions were so honest. I could tell when she wasn’t feeling good and when she was feeling confident. She felt genuine joy in the growth and improvement of her baby. When he wasn’t doing so well you could see how much it pained her. She talked to him, kissed him, loved on him. Because of his age, Daniel was drinking infant formula. We weren’t giving him Mamba. We weren’t giving him enriched cow’s milk. Simply formula. He responded very well and gained weight rapidly. He cried whenever he was hungry and his mom promptly made him a bottle. Miselene was extremely cautious about hygiene. She washed her hands. She made sure the bottle was clean. And Daniel was never sick with diarrhea or vomiting. We never doubted that he would gain weight at a steady, constant rate yet Miselene was excited every, single, day when he did. She had this way of saying, “ohhhhh Daniellllll” surprised, yet not really surprised, the way you would continue to praise a toilet training toddler each and every time he did his business in the right place. She really was so happy to see Daniel improve even the slightest bit. She bonded with him over each and every bottle. And she kept track of every single ounce. Honestly, Daniel was a really easy case. We didn’t have to do much for him yet for this family that little bit made all the difference in the world. Daniel was referred by Children of the Promise. His mom went to COTP because she heard that her baby could be helped there. She went to their gate and asked that Daniel be taken into their creche. When they told her he’d be better of with his mother, she got desperate, asking if their was another orphanage she could take him to. She felt she had reached the end of her capacity to care for him. She wanted help. Mostly she just wanted him to survive. COTP thought that Daniel and Miselene would do well at Second Mile. my kid weighed more than that when he was born! Yes.. 6.6 lbs is tiny for a 3 month old. Daniel had been drinking tea and drinking formula when his mother could procure it. Daniel’s mom had not been breast feeding. She said she didn’t have milk. And after assessment of her own nutritional status it wasn’t hard to see that that was likely the truth. Her health was part of the problem. At the time when Daniel and Miselene came to Second Mile, she had been battling a cough for many weeks. Her body looked worn. She seemed weak and tired and hadn’t yet gotten to the bottom of her symptoms. She had gone to a clinic relatively near her home and was seen by a doctor who wanted to rule out Tuberculosis by doing a sputum test. The test was free and if in fact she had Tuberculosis the medication would be free as well. But it was the cost of transportation to the clinic (and the fact that her son was also not well) that kept her from following through. For the sputum test, she had to bring a series of three samples on three separate days. Meaning, that she had to assemble enough money to travel not once, not twice, but three days in a row. have tuberculosis. I was so relieved! But why did she still seem so disheartened? didn’t have answers and answers cost money. When they told her she didn’t have TB they also told her she should return to the clinic the next day so that she could be seen by the doctor. The doctor would likely prescribe more tests or if she was lucky, just write her a prescription to treat her symptoms. Only those tests and those medications would not be free. In Mislene's mind, a sixth visit was out of the question. Thankfully, after a few days of rest and a few high-energy meals, and some OTC cough syrup Miselene did begin to feel better. By the second week it was much easier to look at Daniel.. he wasn’t the fragile little skeleton he had been on the first day. By week four he was actually filling up the scale. He was doing well enough to go home. He was no longer severely malnourished and had even reached the growth chart median for a child of his length. Very impressive, indeed! But on the day we began preparing his mom to go home, Daniel developed respiratory distress. Instead of sending him home we gave him a breathing treatment and sent him to the hospital to be seen. The doctor prescribed nasal drops, vitamin C, and an antibiotic. The total cost of the consultation, the laboratory tests, and the medication was $12.24. Totally affordable, right? Yet $12.24 would have been an inhibitory sum for this mom. She came back from the clinic smiling, not because it wasn’t an exhausting day (she was at the hospital from 7 am - 3 pm), but because she had something tangible she could do for her son. She had both answers and a solution. Daniel stayed the following week so that we could monitor him as he recovered from his respiratory infection. Again, at the end of the week we were ready to send him home but coincidently Miselene was under the weather. She had a fever with body aches and a headache and well the thought of packing everything up and leaving made her cry. They stayed another week. Miselene worked just as hard and was just as attentive in all the classes as if it were her first week, not her 7th. But after that, we simply didn’t have any reason to keep them any longer (although we did try to think of something). Miselene was also a star pupil in health education. She asked questions. Paid attention. And when all was said and done she scored 100% on her health post test. Most of the health education sessions had been taught by Ms. Kerline but this week she's been at a training seminar, learning how to perform infant massage. In her place, Ms. Prestina, our nurse and the newest member of our team, gave Miselene her parting exam. The exam is done orally. Kerline, or in this case Prestina, asks the questions and writes the mother’s response. There are about 20 questions such as What causes malnutrition?, What is a balanced diet and can you give examples from each of the three food groups?, What can be done to prevent your child from getting diarrhea?, What are the benefits of pre-natal visits when you are pregnant? etc. etc. When I saw Prestina immediately after she gave Miselene her test, she was practically speechless. She managed to squeak out some accolade in fancy french. A simple "she did a great job" just wasn’t adequate. Most of the moms score between 20% - 60% on similar test given on their first or second day at Second Mile, before they complete any of the health education sessions. Miselene scored a 59%. And after? 100%... We’ve never had another mom do quite so well. I felt like dancing inside. I told every person in my path and made a Facebook status when I finally got internet last night. It was 10 pm.. but the world needed to know! We grow to love these women and want so badly for them to do well. When something, anything, aligns in their favor it seems like an impossibly positive step forward. The likes of which, can happen so rarely for these women. On Tuesday Morning we did one final assessment to get Daniel's measurements recorded in his chart and to determine a good goal weight for his first follow-up visit (next week). Then we performed one last test. With a quick finger prick and a tiny drop of blood we can tell whether or not a child is anemic and the severity of it. Anemia and malnutrition march hand-in-hand wrecking havoc in little bodies, but some children are worse off than others. The hemoglobinnometer we funded through the Holiday Catalog is an amazing little machine that works in much the same way as those pocket-sized glucose monitors people use to check their blood sugar. On Day 1 Daniel’s hemoglobin level was so low it wouldn’t even register on the machine. After 7 weeks of infant formula and liquid supplemental iron, his hemoglobin had improved to a 9. Still low, but on the rise. much [money] to keep a family together and to nudge a child in the right direction, that is, the one of more birthdays. Here's what it looked like in terms of time and resources spent directly on this family. The "priceless" bit might have been a bit cheesy. Sorry about that. But I think you get my point. and their big sisters too..
on Facebook with a status about how we were entering our biggest month in terms of garden produce. month? Like "big" because all the crops are going to shoot up in all this rain?" yet. Well, how 'bout that. Time flies. It seems like just yesterday that the garden workers had worked to clear the land and we hired a few extra hands from the community to get the seeds planted. Truly it is about to be a "big" month as our garden is now 3 times the size of our last garden and at least 5 times the size of our very first attempt to grow things. Our garden space spans not only the back two acres of "the land." But also an acre plot just to the right. We will sell the produce, use it to make meals for the moms and babies, and this season we will make our first attempt to save some seeds. I took a bunch of garden photos on Friday. I thought I would give you a little tour of the garden, but I realize now that I completely forgot to photograph the tomoato plants and the carrots. You will have to use your imagination. Cabbage close up... I think the cabbage is striking, and very deserving of 3 feature photos in this blog post. The first day of that big harvest I was telling you about. I just did some rough calculations and I believe, that last week was our 34th week with mothers and children at the facility. We had 8 moms with 8 children in rehabilitation, and 2 siblings. Several of the kids made huge leaps of progress this week. An 18 month old who has never been able to stand is now walking with her mom's help. A baby that has been with us for a ridiculously long time is now finally making the kind of progress you start to think isn't possible. And a baby learned to breastfeed. It was one of the more remarkable things I've experienced in my time in Haiti. It deserves it's own blog post... although every time I say that about a mom or a situation I hardly ever follow through. Here's to hoping that this won't be one of those times. The story of how a 17 year old girl came to successfully breastfeed her 6 week old baby after having not breastfed since it was 5 days old... well it really is a phenomenal story. We've come to find a very special use for the small blackboards that are in each of the rooms. Each room has two beds, two shelves, two chairs, two black boards, two moms and two + babies. For the first time this week, Errod used those blackboards to assign weekly chores. One momma sweeps the education building each morning. A few moms are on morning garden duty, filling watering cans just as the sun rises. There is a mom on breakfast dish duty, another on lunch dish duty. One mom cleans the bathroom. Each week they help in a different way. There is rhythm and harmony to the day with the understanding that each child's needs are different, each mother's day will look different, and feeding and caring for one's child takes precedent. There is even harmony at the end of the week when we must plan for 8 women and children to go to 8 different places. When planning Friday's travel arrangements the moms are affectionately referred to by their home-cities by Jenn, Dadou, and Errod. I promise it's very affectionate. For some, the nickname's have stuck and even the moms call out to their friends with the city-moniker. Like "Milot! It's your turn to leave!" We give the moms the money they will need to travel home and bring them by moto or car to the nearest point where they can catch a tap-tap. Some moms only have to travel a distance of 20 minutes, for others it takes more than an hour. They take their babies with them with everything they will need for the weekend. In the current group of moms there are two children who have cerebral palsy. Friday morning we drop them off at the Baptist Hospital (HHA) where the moms spend a few hours learning range of motion exercises and other techniques they can practice during the week. Haiti Hospital Appeal is the only place we know of that offers a physical therapy service. We are so fortunate that they are located so close to our site. The moms really appreciate the opportunity to learn how to help their kids. Two of the kids had diarrhea on Tuesday. Kerline, took the opportunity to make "diarrhea" the topic of the morning's health education session. A hands-on activity, "how to prepare oral rehydration drink" was the cornerstone of the session. The drink was then split between the two children that needed it and the diarrhea was resolved by the end of the day. Another highlight this week was the advent of literacy classes for the mothers. I can't tell you what made me smile more.. Was it hearing the certain din at 2:55 pm as the mothers would begin warning each other "class is about to start," "the professor is waiting!" and "finish your homework!" Or was it watching Ama, a life long teacher, lead the class like an expert conductor, helping each woman advance according to her level of skill and proficiency? Maybe all of the above. Some moms are more educated than others but none of them have advanced further than the 6th grade, a few had been enrolled in first or second grade while other had never been to school at all. The moms who can read and write are practicing addition and subtraction problems and honing their math skills. This will be helpful when they start their businesses. Moms who have mastered the alphabet have moved on to writing their name. Once they have mastered their own names they will move on to the names of their children. How useful for these mothers. It is a small thing that will make enrolling their children in school, or bringing them to the hospital just an ounce easier. One afternoon I stopped by the education center to peak in on the class. I arrived just in time to see a mom who couldn't tell the difference between a 2 and a 7, tap the board with her pen 26 times, correctly naming each letter of the alphabet. There's no such thing as a hopeless case, but between you and me, if you knew this mother you'd be crying tears of astonishment to see her do what she's doing here. On yet another afternoon I wandered into one of the recovery rooms and noticed an open notebook on the bed. The page was filled with one sentence, written repeatedly in impeccable script. First name Last name is very intelligent. How long did that take her? Did she leave her notebook out in the open to show off her work? She must be proud. And that sentence... what a fitting choice of words. Either it was her "homework" to copy that particular sentence, in which case Professor Ama has a knack for injecting confidence-building into his classes, or, this mom was just already feeling that empowered. Kids walking, breastfeeding, smiling, and growing. Moms learning and helping one another, smiling, and growing. Second Mile is exactly what we hoped it would be.